* I modelled myself in to a bit of a corner the first time as the operating hole in the tie bar of the Y point built for me by Neil Rushby is on the front side of the layout. So I laid the wire-in-tubes that side, and then realised it would be slightly ridiculous to operate the layout from the front while the off-stage traverser and hidden track is at the back. Version 2 has the controls at the back but it means the wire and tube for the Y point has to come underneath from the “wrong” side. 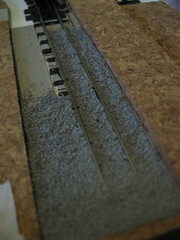 But in the end it was easy to cut a trench in the foamboard and the point throws just as well this way round. 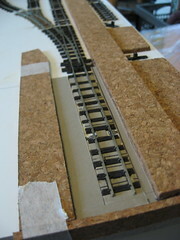 ** My normal practice is to pin track down, usually through a layer of cork. The foamboard doesn’t offer a very firm surface to pin to so I decided to try gluing instead, using the same UHU Power as in the construction of the baseboard. I was a little sceptical as to how this would cope with the throw of the point, but now all the glue has set it seems to be holding fine. 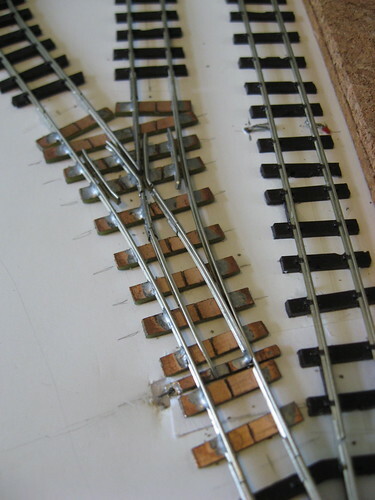 *** I’m using a finer grade of ballast than on Fairlight, to hopefully better represent the kind of mushy, grotty muck holding the rails in place on a dilapidated old line. To get the ballast up to almost the level of the rail tops without needing to pour a depth of several milimetres and then gallons of dilute PVA to hold it in place, I’m experimenting with infilling the sleepers with thick card and then ballasting on top of that. 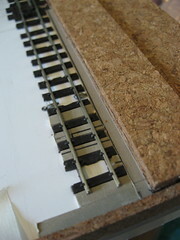 Once the initial ballast layer is dry I will be adding other scenic materials to give a “lived in” look. Ideally I would like it completely over-run with long grass but that may have an adverse effect on electrical continuity and the running of light 009 stock.